Temporomandibular joint (TMJ) syndrome is a serious condition that causes severe jaw pain. 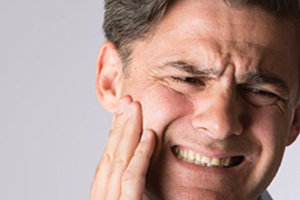 There are many causes of TMJ, including grinding your teeth, stress, and eating certain foods. Unfortunately, there is no real cure, but lifestyle changes can help you manage. If you have TMJ, try our tips to ease or eliminate your suffering. This might seem counterproductive – if you’re in pain, wouldn’t exercising or stretching your jaw make it worse? Surprisingly, most doctors say no. According to the American Academy of Family Physicians, exercise helps ease mild-to-moderate TMJ pain. Simply put some resistance on your chin and open and close your mouth in prescribed ways. One popular TMJ exercise is resisted opening. Put your thumb under your chin while placing your index finger from the same hand on the area between your lower lip and chin. While pushing down against your thumb, open your mouth. Push gently again as you close, and repeat. In addition to exercises, stretch your jaw often. Before stretching, relax your jaw as much as possible. Then perform easy exercises, such as opening your mouth wide with your teeth slightly apart while looking up (move your eyes, but not your head). Hold your mouth open for a few seconds before closing. As your jaw gets stronger, hold your mouth open for longer periods. You can also try moving your jaw to the left or right while looking in those directions with your eyes. Many TMJ cases are stress-related, so professionals recommend de-stressing exercises such as deep breathing. Even if TMJ isn’t stress-related, such exercises help ease the pain. Breathe deeply through your nose, count slowly to 5 or 10, and then let the breath out through your mouth. Do this a few times – say, three to five times in one sitting – until you feel more relaxed. Don’t open your mouth too wide or brush too hard, especially when trying to reach your molars. Invest in a brush with an extended handle to take stress off your mouth. Use toothpaste specifically made for sensitive teeth. If brushing and flossing hurts despite these efforts, see your dentist right away. He or she may recommend different treatment.